Market town or market right is a legal term, originating in the Middle Ages, for a European settlement that has the right to host markets, distinguishing it from a village and city. 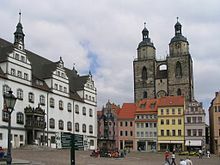 On the European continent, a town may be correctly described as a "market town" or as having "market rights", even if it no longer holds a market, provided the legal right to do so still exists. In Britain it remains in common use as a loose descriptive term for small rural towns with a hinterland of villages. It is sometimes reflected in their names, as with Downham Market, Market Rasen, or Market Drayton. Modern markets are often in special halls, but this is a recent development. Historically the markets were open-air, held in what is usually called (regardless of its actual shape) the market square (or "Market Place" etc), and centred on a market cross (mercat cross in Scotland). They were and are typically open one or two days a week. The primary purpose of a market town is the provision of goods and services to the surrounding locality. Although market towns were known in antiquity, their number increased rapidly from the 12th century. Market towns across Europe flourished with an improved economy, a more urbanised society and the widespread introduction of a cash-based economy. The Domesday Book of 1086 lists 50 markets in England. Some 2,000 new markets were established between 1200 and 1349. The burgeoning of market towns occurred across Europe around the same time. Initially, market towns most often grew up close to fortified places, such as castles or monasteries, not only to enjoy their protection, but also because large manorial households and monasteries generated demand for goods and services. Historians term these very early market towns "prescriptive market towns" in that they may not have enjoyed any official sanction such as a charter, but were accorded market town status through custom and practice if they had been in existence prior to 1199. From a very early stage, kings and administrators understood that a successful market town attracted people, generated revenue and would pay for the town's defences. In around the 12th century, English and European kings began granting charters to villages allowing them to hold markets on specific days. 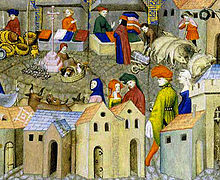 A number of studies have pointed to the prevalence of the periodic market in medieval towns and rural areas due to the localised nature of the economy. The marketplace was the commonly accepted location for trade, social interaction, transfer of information and gossip. A broad range of retailers congregated in market towns – peddlers, retailers, hucksters, stallholders, merchants and other types of trader. Some were professional traders occupied a local shopfront such as a bakery or alehouse, while others were casual traders who set up a stall or carried their wares around in baskets on market days. Market trade supplied for the needs of local consumers whether they were visitors or local residents. Braudel and Reynold have made a systematic study of European market towns between the 13th and 15th century. Their investigation shows that in regional districts markets were held once or twice a week while daily markets were common in larger cities. Over time, permanent shops began opening daily and gradually supplanted the periodic markets, while peddlers or itinerant sellers continued to fill in any gaps in distribution. The physical market was characterised by transactional exchange and bartering systems were commonplace. Shops had higher overhead costs, but were able to offer regular trading hours and a relationship with customers and may have offered added value services, such as credit terms to reliable customers. The economy was characterised by local trading in which goods were traded across relatively short distances. Braudel reports that, in 1600, grain moved just 5–10 miles; cattle 40–70 miles; wool and wollen cloth 20–40 miles. However, following the European age of discovery, goods were imported from afar – calico cloth from India, porcelain, silk and tea from China, spices from India and South-East Asia and tobacco, sugar, rum and coffee from the New World. The importance of local markets began to decline in the mid-16th century. Permanent shops which provided more stable trading hours began to supplant the periodic market. In addition, the rise of a merchant class led to the import and exports of a broad range of goods, contributing to a reduced reliance on local produce. At the centre of this new global mercantile trade was Antwerp, which by the mid-16th century, was the undisputed largest market town in Europe. A good number of local histories of individual market towns can be found. However, more general histories of the rise of market-towns across Europe are much more difficult to locate. Clark points out that while a good deal is known about the economic value of markets in local economies, the cultural role of market-towns has received scant scholarly attention. In Denmark, the concept of the market town (Danish: købstad) has existed since the Iron Age. It is not known which was the first Danish market town, but Hedeby (part of modern-day Schleswig-Holstein) and Ribe were among the first. Per 1801, there were 74 market towns in Denmark (see the full list here). The last town to gain market rights (Danish: købstadsprivilegier) was Skjern in 1958. At the municipal reform of 1970, market towns were merged with neighboring parishes, and the market towns lost their special status and privileges. Market cross at Devizes, a market town in Wiltshire. Market Scene by Jan van Horst, n.d.
Market in Poltava by Vladimir Egorovich Makovsky, n.d.
^ "National Market Traders' Federation". Rosiewinterton.co.uk. Retrieved 3 January 2011. ^ "Markets and Fairs". The National Archives. Retrieved 9 July 2012. ^ Gazetteer of Markets and Fairs in England and Wales to 1516. University of London Institute of Historical Research. Retrieved 9 July 2012. ^ "Historic Towns of Scotland". Retrieved 21 June 2015.